Now, let’s go back and look at the first concession as described in Genesis 9. 1 And God blessed Noah and his sons and said to them, "Be fruitful and multiply, and fill the earth. 2 And the fear of you and the terror of you shall be on every beast of the earth and on every bird of the sky; with everything that creeps on the ground, and all the fish of the sea, into your hand they are given. 3 Every moving thing that is alive shall be food for you; I give all to you, as I gave the green plant. 4 Only you shall not eat flesh with its life, that is, its blood. Just because God blesses Noah and his sons, it should not be construed as being in the will of God. 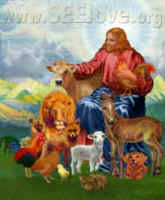 In Genesis 1:29-30, we are clearly told that God’s will is for all animals (human and otherwise) to eat plant foods. Therefore, this is clearly a concession granted by God due to the hardness of heart of human beings. Also, it is impossible to eat the flesh of animals without some of the blood remaining, so we know that this carries a type of penalty with it, such as all the food-borne illnesses that millions of people suffer each and every year, and that animal products are the root cause of most chronic diseases. While the Israelites were in the wilderness, the Lord fed them with manna, a vegan bread from heaven; but the people rejected this, too, and grumbled that they wanted flesh to eat. 31 Now there went forth a wind from the LORD, and it brought quail from the sea, and let them fall beside the camp, about a day's journey on this side and a day's journey on the other side, all around the camp, and about two cubits deep on the surface of the ground. 32 And the people spent all day and all night and all the next day, and gathered the quail (he who gathered least gathered ten homers) and they spread them out for themselves all around the camp. 33 While the meat was still between their teeth, before it was chewed, the anger of the LORD was kindled against the people, and the LORD struck the people with a very severe plague. First of all, we know that the Lord didn’t kill this many birds; for they were probably more than existed in the whole world. Furthermore, to be piled three feet deep they had to be dead, which means that the Lord created them for this purpose. The fact that the people died is further evidence that the people were not living in the will of God. God granted the concession, but it also came with a penalty. A much more subtle concession is involved in the sacrificial system of the Israelites. If the people had obeyed the Lord their God, there would have been no need for a sacrifice to atone for their sins. And we can go a step further and say that the whole of Christendom is based upon the same concession. If there had been no turning away from God, if there had been no disobedience, if there had been no curse of death following the Fall, there would be no need for a Messiah. This may be hard to comprehend, but the closer we get to understanding the intent of God, and His perfection, the easier it is to understand our imperfections, and the extraordinary love of God in trying to bring His errant people back into His fold.